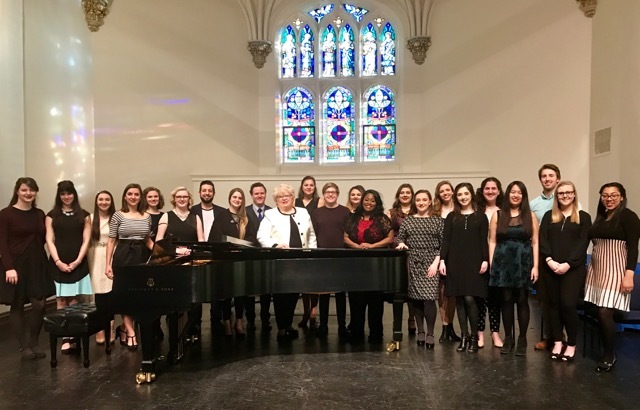 Renowned American soprano Christine Brewer closed her Spring 2018 residency with a vocal concert on Friday, Feb. 2. The performance featured more than two dozen students and faculty from the Department of Music. Students involved in the project represent six different programs in the music department. Brewer’s fourth annual residency focused on the forgotten voices of composers who were imprisoned at, or passed through, the Terezin concentration camp during World War II. Brewer noted in her comments that this particular camp housed numerous artists, and music flourished there for a time. Of particular note were new works by junior composition major Hunter Johnson, and music by faculty composer Kim Portnoy. Brewer herself performed works by Kurt Weill and Portnoy. Brewer, acclaimed by BBC Magazine as one of the 20 greatest living operatic sopranos, makes her home nearby in Lebanon, Illinois. She continues to sing on major operatic stages and in concert halls around the world, and has been visiting professor of Music at Webster for the last decade.